Eugenie, Tanner and I were in Santa Barbara this past February, when we met a lovely woman named Jo Hartman, who volunteers at the Central Coast SPCA. 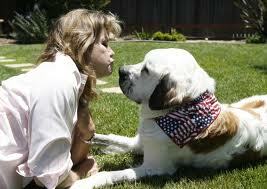 Here’s a link to a story in the Santa Maria Times about her and her late rescue St. Bernard, Dover. Her work with him goes to show how love and patience can change a throw-away dog into a life saver. Way to go, Jo.